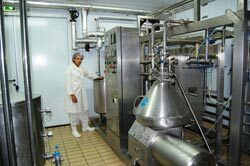 This project has improved the competitiveness of a family-owned dairy processing unit in Cyprus through a business expansion operation that involved the construction of new dedicated facilities for processing dairy products. 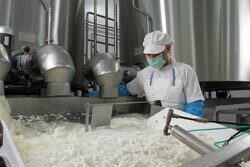 The family-owned Halloumi cheese factory in Cyprus processes milk into various dairy products which are sold in national (20%) and international (80%) markets. 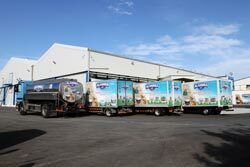 As a result of increasing turnover in recent years, the old dairy unit could not meet the growing demand and the company received RDP support for a business expansion project. A business plan was developed, including a significant investment project, with the aim of: 1) Increasing production and sales; 2) Increasing exports, and; 3) Improving product quality. 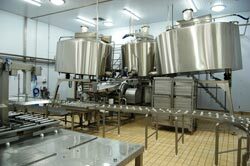 The main components of the investment project included: i) relocating the dairy unit into a modern building in an industrial park; ii) purchasing and installing more modern dairy processing equipment, and; iii) installation modern health equipment and developing new quality management systems. Two applications for EAFRD funding were successfully submitted under RDP measure 123 (adding value to agricultural and forestry products) for a total of 2 100 000 EUR. Direct results of EAFRD investment support have included: a) increased production with turnover increased by 30-40% and supply of dairy products to the Cypriot market increased by 20-25% in 2009-2010; b) new and improved quality management (in accordance with BRC and IFS certification); c) increased exports by 28% in 2009-2010, and; d) increased total annual turnover - from 8 000 000 EUR in 2008 to 9 500 000 EUR in 2009 (the first operating year for the new dairy unit).